The fact that the African Plate, during previous rolls, created mountain building can be seen on a relief map. Morocco and Algeria have mountains due to the rolling in the past. One can see in the mountains of Spain and Italy and the Balcans and Turkey that this was the case there, too, in the past. The Alps themselves were built during previous African rolls. But this time the African Plate will drop away significantly, slipping to the south during the roll. This movement is possible because as the South Atlantic Rift tears open, there is room for the tip of Africa to slid into that void, thus dropping the entire African Plate as it rolls. The African Plate not only moves to the south during this process, it also further to the west, although the southern portion of Africa moves more in this direction more than the parts abutting the Mediterranean. That said, why would the floor of the Mediterranean just above Algeria be more vulnerable than other areas during this roll? The border of the African Plate slices across northern Algeria, and thus when the plate rolls and drops, the Mediterranean floor there will suddenly find itself unsupported. Where the land mass housing Morocco and Algeria will not lose elevation, in the main, retaining its floatation strength to ride on the magma beneath, the floor of the Mediterranean is of a different composition. It will sink there, unsupported on the African side where the plates will pull apart. The Mediterranean coastline of Algeria will then find more than tsunami worries as they will have a loss of elevation by 12 feet or more. Their coastline is not part of the African Plate. What sinks and what continues to float on the magma beneath is a factor of the rock density, and the floor of the Mediterranean above Algeria has only been floating as it has due to the connection with the African Plate. Elsewhere, where the Mediterranean floor spreads during the roll, the floor is either too deep for a change to be noticed or at a distance from the plate border. Tsunami will not occur to any ostensible degree because there is a void being created, where the waters will rush. However, turmoil and wave action can be anticipated. 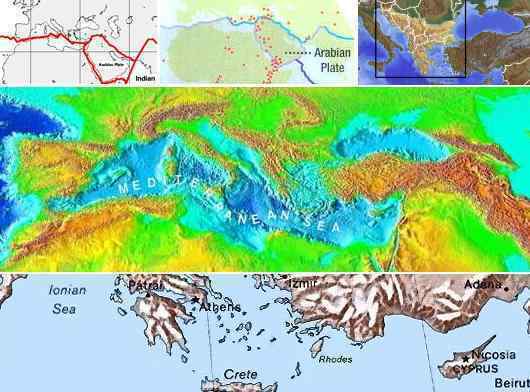 The shifting of the African Plate will also not incite any mountain building in Italy or the Balcans or Turkey, as the northern edge of the African Plate is not the solid, jutting line through the center of the Mediterranean that mankind assumes. The sea is deep there, to the south of Italy and the Balcans and Greece, and for good reason. This part of the great plates has fractured in the past, so that many fault lines lie under the surface, unknown to man until dramatic plate movements begin. The roll of the African Plate during the 7 of 10 scenarios thus spares all but the Mediterranean floor above Algeria! The roll will incite the Arabian Plate to roll also, to some degree, as across from Egypt there will be pressure, but further down the Red Sea there will be a tearing apart, inviting the Arabian Plate to migrate in this direction. However, this is not the disaster we have predicted for Iraq, not yet. Nor will the Afar Triangle, the African Rift Valley, experience changes all that dramatic during this roll. Why would land along the coastline of Tunisia be drawn down as Africa rolls? As Africa tears away, dropping to the south, the Mediterranean floor loses support. We have explained how the coastline of Algeria will lose 12 feet in elevation as a result of the African roll, as the border of the African Plate slices across the coastline there. Where this is the final result for the Algerian coastline and where Morocco can expect significant stretching at its tip as the African Plate drops, the drop is not uniform across the boundary with the Mediterranean Plate. As has been noted by the tearing Internet cables at Kenya and the Red Sea, the eastern top of Africa is dropping while western top of the African Plate is holding. Africa will tilt toward the east as it drops, as we have explained. 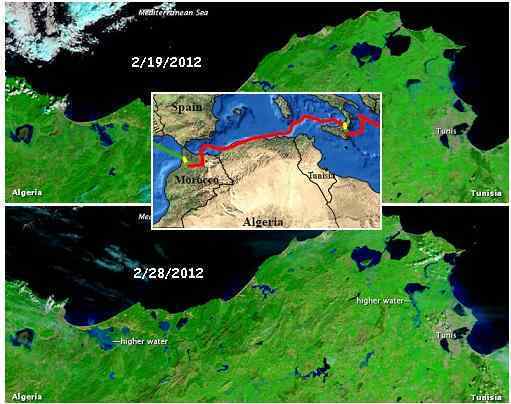 What this does for Tunisia is pull some of the land along the border with the Mediterranean Plate down. This is an uneven drop, as the thickness of the plate is not even, so that some parts may lose elevation while others continue to float at their current level.